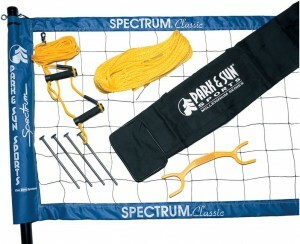 If you need a professional level outdoor volleyball net system that’s portable, durable, quick to setup and offers exceptional playability at all volleyball skill levels from beginner to advanced then look no further than the Park & Sun TS-CL Spectrum Classic Volleyball Set. I currently own and use the Park & Sun Tournament 179 (see my review here) volleyball set which is also a great system for the price. However, if price wasn’t an issue then I probably would have gone with Spectrum Classic. I believe the best way to showcase the Spectrum Classic system is by comparing it with the Tournament 179 system. The following specs and features list highlights the similarities and differences between the Tournament 179 system and the Spectrum Classic. Sleeve style nets for portable systems typically provide an experience that is more comparable with a fixed indoor net system as opposed to the slip on straps style net that comes with the 179. 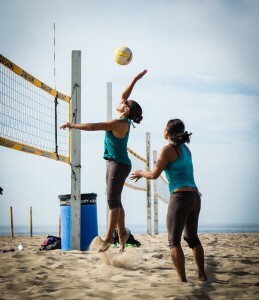 With sleeve style, you can expect good tension from top to bottom as well as playability off the net. The slip on straps style net that comes with the 179 has good top tension but barely any tension at the bottom. A ball into the net of a 179 system will just roll through the bottom strap to the other side. One of the key elements of any outdoor volleyball set is the guyline system and the apparatus used to tension and secure the guylines. The 179 guyline system with its tension rings is adequate but often needs adjusting even after a short period of rigorous play. The handle system that comes with the Spectrum Classic set is practically set-it and forget-it. The only other notable difference between the 179 and the Classic is the length of the ground stakes. 8 inch stakes are included with the 179 whereas additional in-ground anchorage is provided by 12-inch stakes that come with the Classic set. The heights of the poles of both systems are men’s 8 ft. coed 7 ft. 8 inches and 7 ft. 4 inches for women. The boundary lines, cord winder and zip up bag all appear to be identical or very similar. Outstanding, top notch and excellent are just some of the amazon.com reviewer comments that make up the 5 star majority rating of this system. Most reviews note the easy quick setup process, good quality of the components and firmness of the overall system once setup. A good number of reviewers were either coaches or tournament sponsors. The very few low star ratings mentioned quality issues with the net and the extra effort that might be needed to set the system up on sand. One reviewer also noted that the dimensions of the boundary lines in the set that they received wasn’t exactly 30 by 60 and needed to be adjusted. For the most part, the overall satisfaction level of current owners and users of this system has been highly favorable. From beginner to upper level tournament play, the Spectrum Classic outdoor volleyball net system is a winner. amazon.com typically has the best pricing for most Park & Sun outdoor volleyball net systems as well as free shipping and easy returns.